WASHINGTON - MARCH 13: U.S. Supreme Court Justice Anthony Kennedy prepares to testify before the House Financial Services and General Government Subcommittee on Capitol Hill March 8, 2007 in Washington, DC. Kennedy and Justice Clarence Thomas spoke about concerns with the ongoing remodeling of the court building, the reduction of paperwork due to electronic media and the disparity of pay between federal judges and lawyers working in the private sector. Those on the left hoping that moderate Justice Anthony Kennedy might take notice – and maybe even change his voting behavior going forward – as a result of Friday’s New York Times poll showing approval of the Supreme Court dropping to 44 percent are likely to be disappointed. 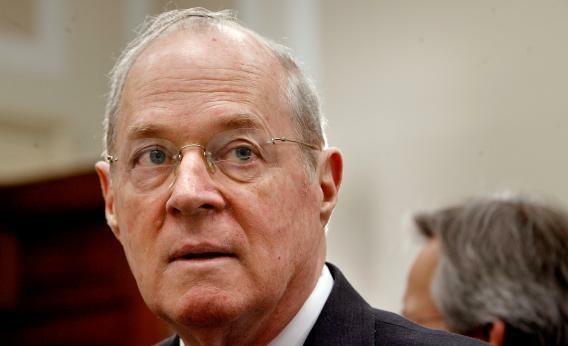 It’s not that Kennedy, who’s known to be among the more politically sensitive justices, won’t hear something about public opinion of the High Court dipping. He probably will. But he won’t care. “The Court’s credibility may be declining, but it’s not cratering,” said Noah Feldman, the Harvard legal historian who clerked for former Justice David Souter. He said Kennedy’s “damned if he does and if he doesn’t,” as the same poll shows a healthy majority of Americans want the Affordable Care Act’s individual mandate thrown out, which presumably will make large segments of the left as outraged as they were after Citizens United in 2010 or Bush v. Gore in 2000. Feldman described Kennedy as someone who doesn’t mind – and might even enjoy – inflaming passions on left and right. And logistically speaking, even if the justice were to be alarmed by the drop in public approval, it’s probably too late for it to make a difference in the ruling on the health law anyway. “There’s no way the opinions aren’t, in substance, already written,” said Feldman.